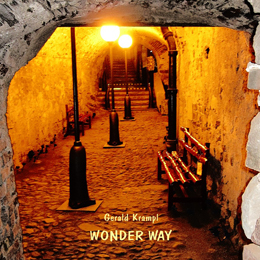 After his previous album, October 2010's Lighthouse (review by yours truly was posted somewhere...in January 2011), Gerald Krampl went on the lookout for a violinist to create the string sounds he used to bring to his music through the means of keyboards, as he was attempting to make his next album sound more like a Neo-Classical/ Ambient Chamber music experience. Wishing to go back to the classical piano training of his youth, the violinist would preferably be of Classical training, as well as a “local” person (remember that Gerald himself is from Austria, from Vienna to be precise)...and after a long search, Gerald finally found one Peter Sagaischek, an original member of the Vienna Volksopern Orchestra. Things hit off real well, as through working together on the project for the album, the two men struck a friendship which has convinced them to continue working together on all of Gerald's future music. As a result of their working together, I should say the aim of creating Neo-Classical/ Ambient Chamber music was indeed achieved. Some will say there's still some fleeting moments where reminiscences to Gerald's former New Age project Agnus Dei [synth being used in the finishing stage of “Mirror Images” (some 80 seconds apparently added afterward in the studio, in order to make for a reasonable length of the track) and the wacky synthesized string sounds of “Regrets” (either generated by using synth on the violin, or by synth tout-court)], or of his Prog Rock days with the bands Kyrie Eleison and Indigo (check the “guitar” inclusion during “Farewell Song”)...but overall one will have to agree that the music is foremost Neo-Classical, best enjoyed in the close intimate environment of those smaller ballrooms in which one used to do those Chamber Music appearances. I'm sure that in case this music would be performed live, the small problem of an additional cellist would be easily solved by inviting one of Peter's colleagues. I mean, as the goal of the project is to get closer to the organic sound, having parts of the sound done by synth would be somewhat of a sacrilege, won't you agree?